With Paths, Bjarni Gunnarsson continues on an even pace of releasing an album every three years, collecting works that debuted in various festivals and installations. The new set is remarkably consistent, albeit difficult to predict; and that’s where the title comes into play. The average music listener is accustomed to hearing songs that follow a specified pattern: for Top 40 music, various permutations of verse-chorus-bridge. 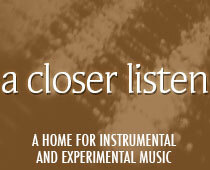 Even in experimental music, form is typically easy to discern. Gunnarsson’s goal here is to explore other paths, to see where the music takes him instead of the other way around. Opora’s cover art, simple at first glance, becomes more complex when viewed as the map of a song or album. It doesn’t seem to make sense; but then it does. The same holds true for Gunnarsson’s music. The first play is the most surprising, as the only constants are the slow, non-tempoed pace and the tonal cluster. Gunnarsson favors a mixture of low rumble and higher pitch, with granular textures and clouds of drone. And clearly – because this must happen in any piece – certain sections are louder than others. But the direction of each track – duration, amount of repetition, timing, stereo effect – is impossible to predict. This makes that very first spin a fascination. Fortunately, the complexity of these five pieces allows for a number of repeated plays before any familiarity sets in. This is where interpretation becomes a little dicey, because the path is now set in the listener’s mind. One knows exactly when to expect the high frequency, the low drone, the momentary silence, the drift from left speaker to right. The effect is akin to that of a physical path, which typically begins with a crunch through underbrush, a few trampled blades of grass, a footprint where rain can collect. As more people discover the path, it grows cleaner, more predictable, well-trodden, even paved.